Kaiji proves that the show Survivor would be 100% more interesting with yakuza, death, and manly tears! It’s not uncommon for me to marathon a 26 episode show in 2 days, but I must say it’s been a while since I’ve felt outright compelled to do so. 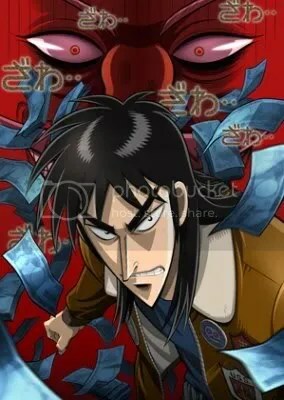 My friend/roommate and I were going to watch some random anime (I was going to pick Sumomomomo Momomo) out of boredom, and when I saw Kaiji while browsing names on a stream site, I thought “this should be something we can all enjoy”. I was hooked instantly, and we ended up marathoning the show in the span of about 30 hours. I cannot understand how anyone could possibly have watched this show with weekly breaks. Aside from being intensely suspenseful, events are pretty dragged out so that not much really happens in one episode beyond intense psychological warfare and slowly moving battles. It’s like watching a 26 episode show about a chess game that lasts 26 turns – every single turn would have it’s own excruciating mental battles and manly tears… and we’re assuming this is a chess game involving yakuza and death. I was already spoiled for a couple of the major twists from a mix of blogs (thanks a lot, Iknight) and 4chan (nighttime /a/ loves this show). However, I was still on the edge of my seat the whole show and loved all of the insane games and even more insane cheating. Part of the games’ appeal to me was the strategy element, me being a fan of strategy games. But more than that, it was definitely the rule breaking. I cheat a LOT in games like this. Back when my brother and I would play Yugioh I won every match either by cheating or by psyching him out (are you SURE you want to attack that face down monster?). I definitely aspire to the theory that a win is a win, depending on who is more cunning. I also loved all the societal commentary. Lots of universal truths, deep meanings, and epic dialogue. My favorite was probably when Tanegura (was that it?) was telling Kaiji how by playing this game, they were having a ‘true conversation’ since they were required to read each others’ emotions. Of course, it turns out he was just cheating, but Kaiji himself is the one who ends up using that theory to pull through. Overall, it was an excellent show. Great pacing (if you marathoned it), awesome writing and characters, cool games, and boatloads of suspense. The only issue is that it might be like Death Note where it’s impossible to rewatch knowing everything that happens. This entry was posted in Review by Digibro. Bookmark the permalink. Nice, sadly I don’t remember much about the show. Maybe if I rewatched some of it, it might refresh my memory. Sounds great, but sadly it will take me a while to get to this show. I also gave Kaiji a two day marathon. In all fairness, it was a planned marathon and I had nothing else to do for those two days. Still, the fact that it remains my quickest 26-episode series marathon speaks to the quality of the show. I liked Kaiji, and it’s a good show, but I never got into it as much as others did. I guess it just wasn’t the type of show for me. Exactly why I’m not so keen in picking up One Outs, which people are singing praises of. Watching it with weekly breaks was torture. I can see how it’s an ideal anime for marathoning with friends.